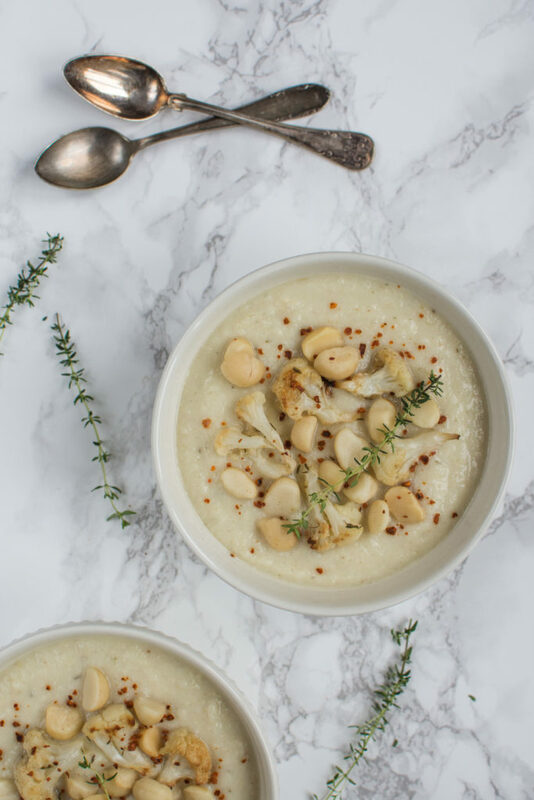 This Roasted Cauliflower Soup is a delicious, dense and creamy soup with a taste of garlic, spices, and thyme. 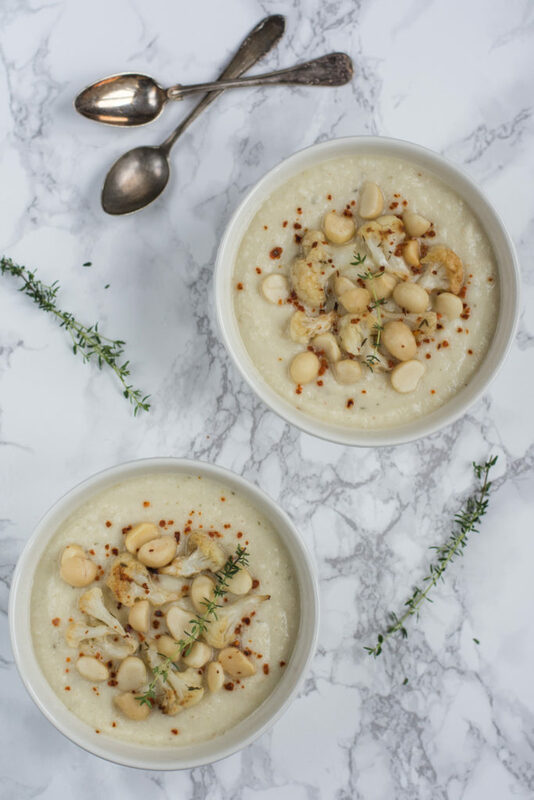 I love to prepare this cauliflower creamy soup for weeknight dinners because it fills but it’s not heavy. And if we don’t finish it all, then it goes to the freezer for later use. Please note that the recipe is vegan as I used almond milk instead of cream. But if you are not on a vegan diet and do not have almond milk, feel free to use cream instead of the almond milk. Macadamia nuts can be replaced by cashew. 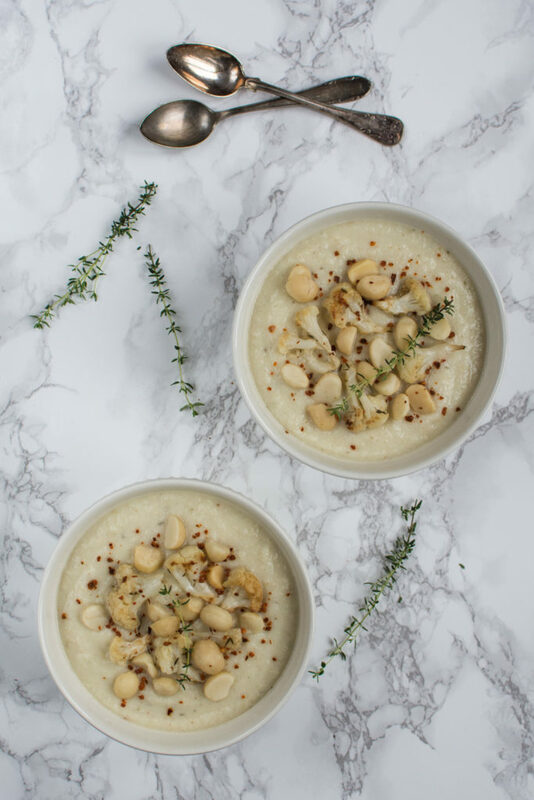 So here is the recipe for this delicious vegan Creamy Roasted Cauliflower Soup. If you make it, let me know how it turns out or share a photo on Instagram! And if you like cauliflower, then you need to try also these Cauliflower Croquettes with Spicy Tomato Salsa! 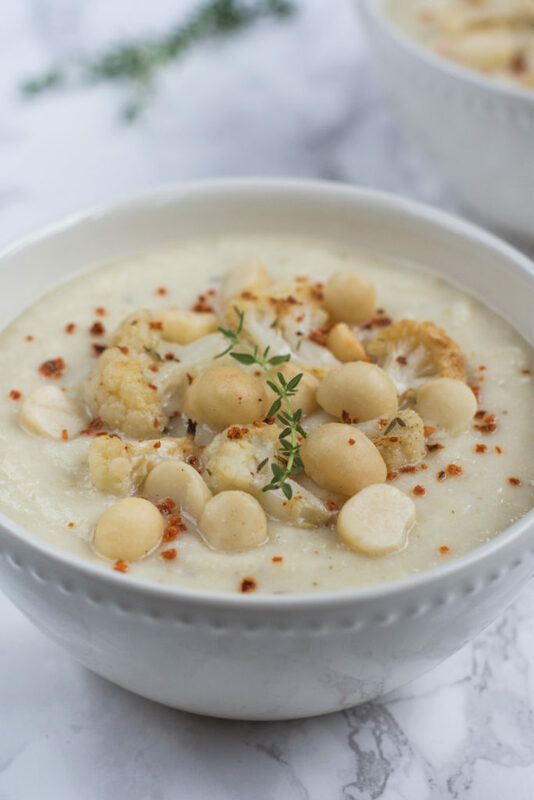 Yummy dense soup made of roasted cauliflower with a taste of garlic, spices and thyme. Roast briefly the macadamia nuts on a pan (without oil). Clean the cauliflower head, remove the stem and external leafs, and trim the head into florets. Mix 3 tbsp. olive oil with finely chopped garlic, cumin, paprika, salt, and thyme. Spread the florets on a baking sheet, pour the mixture over it and bake in the preheated oven for 30 minutes. Remove from the oven and let cool. Peel the potato and cut it into cubes. Heat 1 tbsp. olive oil in a large pot, add chopped shallots, fry them until golden. Then add the potato cubes and fry them shortly. Pour in the vegetable stock, cover and cook for about 15-20 minutes until tender. Select few small florets and reserve for the garnish. 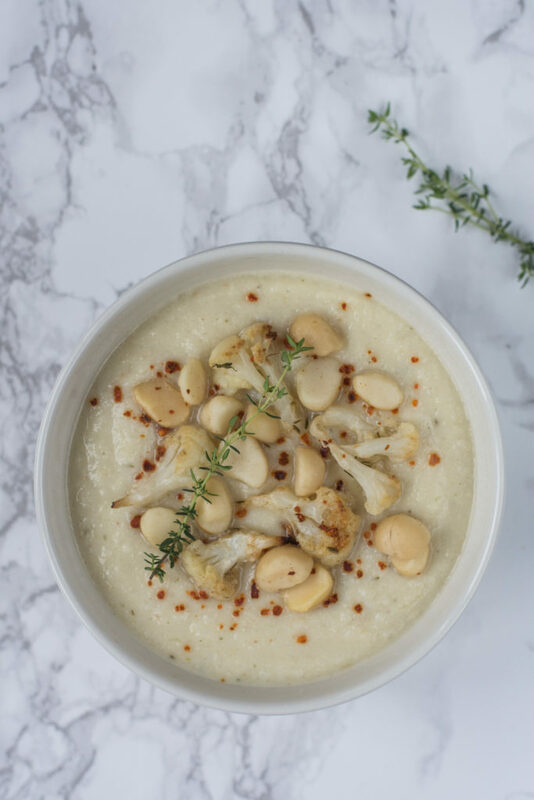 Add the rest of roasted cauliflower and the almond milk to the pot with potato and vegetable stock and blend together using an immersion blender. Add salt and pepper to taste. 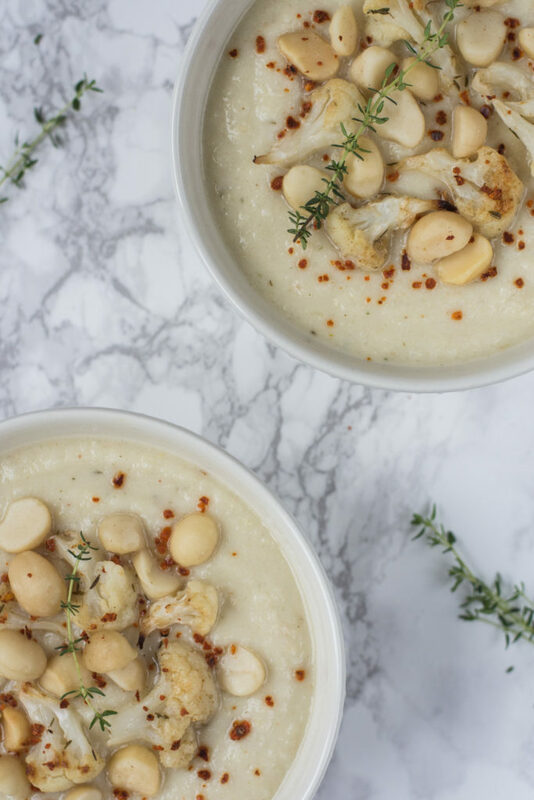 Serve the soup garnished with the reserved roasted cauliflower florets, macadamia nuts, and chilli flakes. If the soup is too thick, add some more water to less dense consistency if desired. For non-vegan soup, you can use cream instead of almond milk. Macadamia nuts can be replaces with cashews.